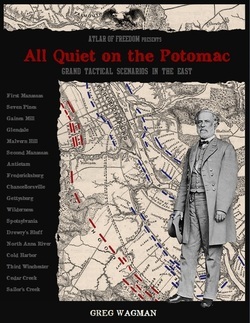 "All Quiet on the Potomac" is our Eastern Theater scenario supplement. This massive PDF covers every major battle fought in the east, from 1861-1865. Each historical scenario has been carefully researched, including color maps and Orders of Battle for the armies. Other rule systems pump out a constant stream of small supplements, forcing you to buy a dozen products to get all the material you want. Not here! Get every grand tactical battle in the east with just one, epic PDF. Still not convinced? Check out the table of contents below to see all the battles covered in this book. Note: This is a scenario supplement only--the main rulebook is required to play the game. * All sales conducted on Wargame Vault. PDF updated in 2015 to include all errata corrections. How about a preview? Download a free PDF for The Battle of Cedar Creek and check it out for yourself! Do you want to know how many bases of infantry you might need to fight these scenarios? This free PDF lists the exact OOB requirements for every single battle!